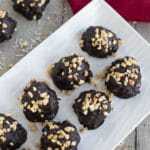 Sharing another Christmas recipe today with these healthier Dark Chocolate Peanut Butter Mounds! So a few weeks ago, when I shared my recipe for apricot raisin coconut balls, I told you guys I had lots of cookie recipes to share. And then I got side tracked with dinner recipes and holiday breakfast ideas. 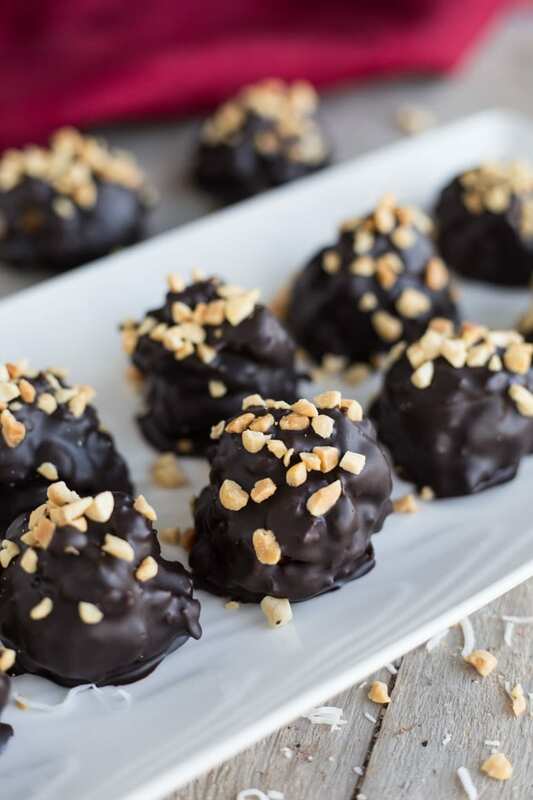 Well, today I’m bringing it back to Christmas cookies with a twist on one of my faves – peanut butter balls. 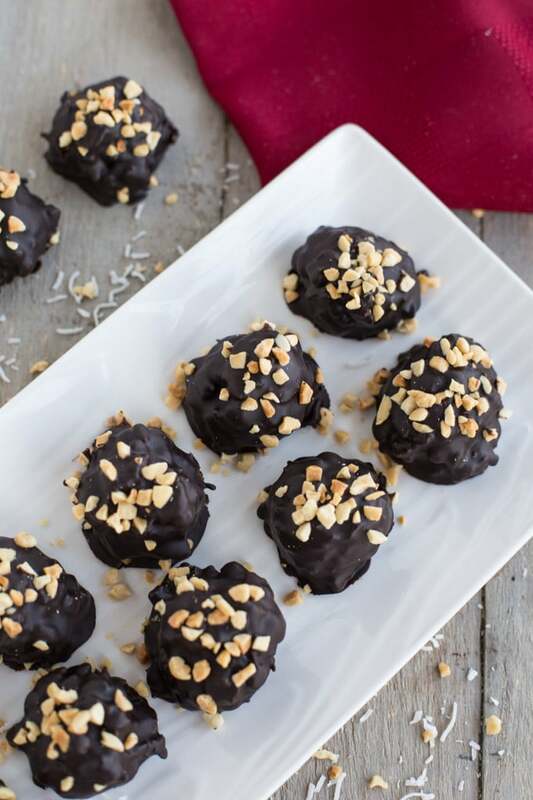 Except these Dark Chocolate Peanut Butter Mounds aren’t your typical peanut butter ball. They are made a littler healthier by substituting in a few clean eating ingredients. Yay! So growing up, my mother always made ‘mice’ cookies around the holidays. I’m not sure if this is a common cookie recipe or just a Newfoundland thing, but they are essentially peanut butter balls shaped like ovals. Being a huge fan of chocolate peanut butter anything, when I started my own Christmas cookie traditions, I knew this recipe had to be in the mix. But I didn’t have the patience to neatly shape them into ‘mice’, and I wasn’t too keen on the name of the cookie anyway. So I just opted to make peanut butter balls. It’s the same concept really, just in a different shape. Fast forward a few years, and now that I’m clean eating, I wanted to turn these yummy treats into a cookie with fewer processed ingredients. Enter these Dark Chocolate Peanut Butter Mounds. 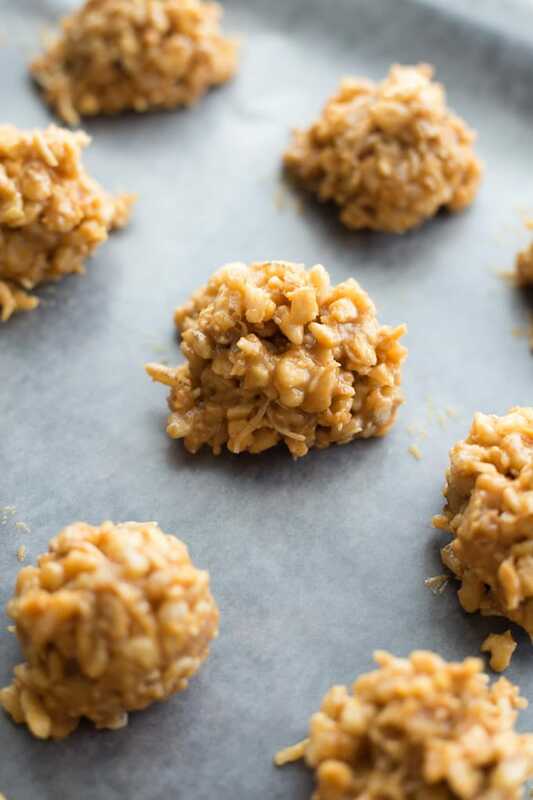 These cookies are simple and easy, and use just a few basic ingredients – peanut butter, maple syrup, nuts, crispy cereal, coconut and chocolate. Best combo ever! Am I right? I even used brown rice krispies to make them a littler healthier! And the best part? They are a great freezer cookie. You can actually eat them right out of the freezer. 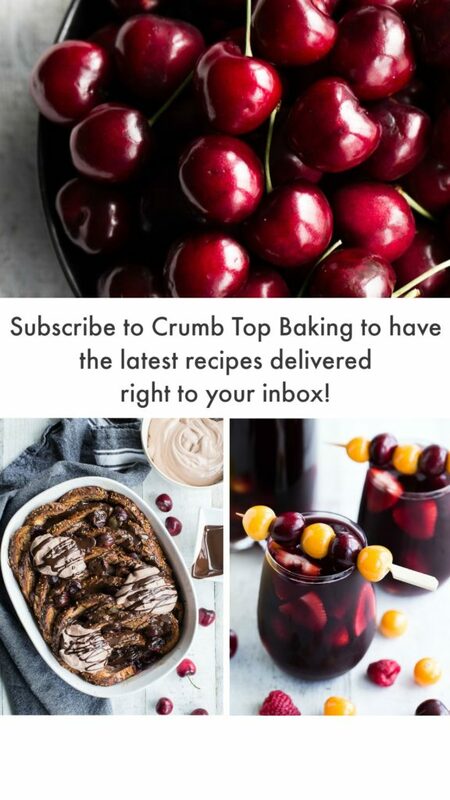 So totally awesome for making ahead for Christmas! As a side note, you might be wondering why I’m calling these cookies mounds and not balls. Well, that’s more in honour of my grandmother who also used to make ‘mice’ cookies, except she didn’t shape hers as neatly as my mother did. And being a child (or perhaps just plain saucy), I called my grandmother’s cookies rats! I’m hoping this was cute coming from a child, but as an adult, I’m slightly mortified that I would say this about my grandmother’s baking! My point is, having tried to shape these cookies into balls, I now realize how sticky and messy that can be. So I opted not to try and shape mine at all, and instead, I used a cookie scoop 😉 . So they look more like mounds than balls. (I thought of calling them rats, but figured that definitely wouldn’t be appealing to those searching for recipes)! So that’s the story behind these Dark Chocolate Peanut Butter Mounds. What’s the story behind some of your favourite Christmas cookies? Maybe this one will become one of your favourites too 😉 !?! 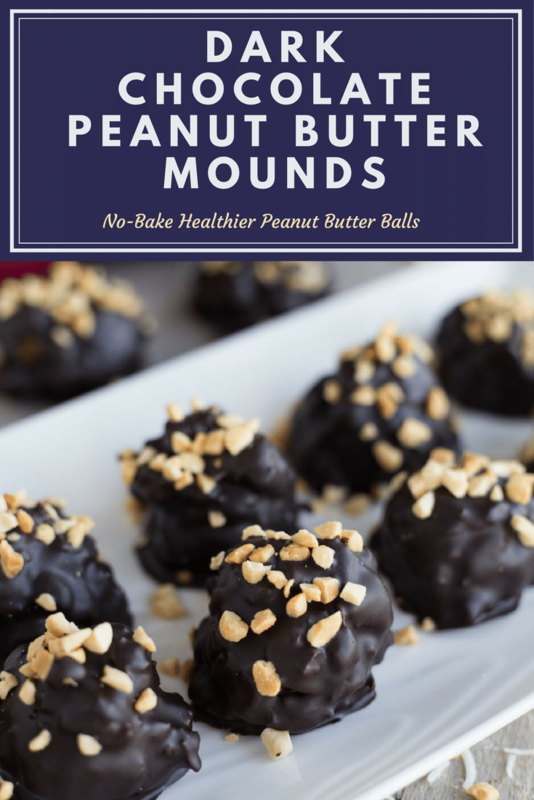 These Dark Chocolate Peanut Butter Mounds are a healthier take on traditional peanut butter balls. 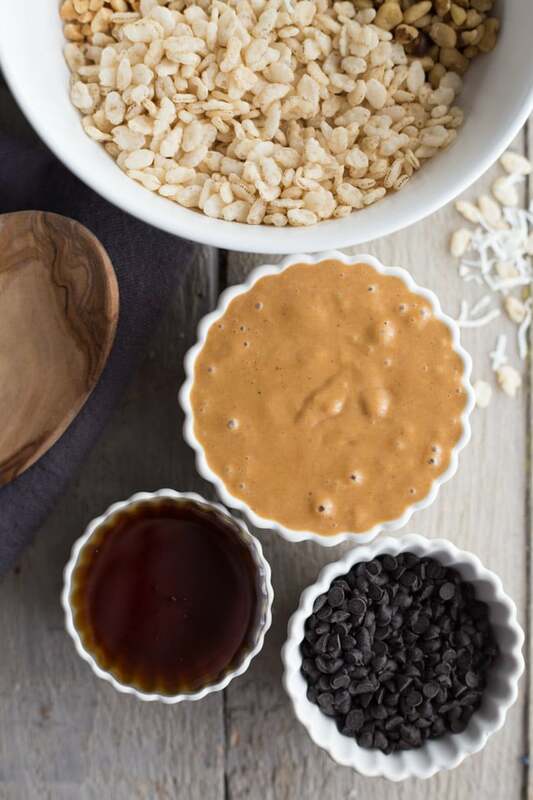 They are still quick and easy to make, but use cleaner, simple ingredients like raw nuts, natural peanut butter, maple syrup, unsweetened coconut, dark chocolate and brown rice krispies. In a medium-sized bowl, add the peanut butter and maple syrup and stir until well combined. Add the rice krispies, nuts and coconut to the peanut butter/maple syrup mixture and stir until well coated. Use a 1-tablespoon cookie scoop to scoop the peanut butter mixture onto the prepared baking sheet. This will yield about 12-14 cookies. Place cookies in the freezer for 30 minutes, or until they have firmed up. In a small microwavable bowl, add the chocolate chips and coconut oil and microwave for 15 second intervals until the chocolate is melted and smooth. Be sure to stir the chocolate in between intervals. (This could take 3-5 intervals). 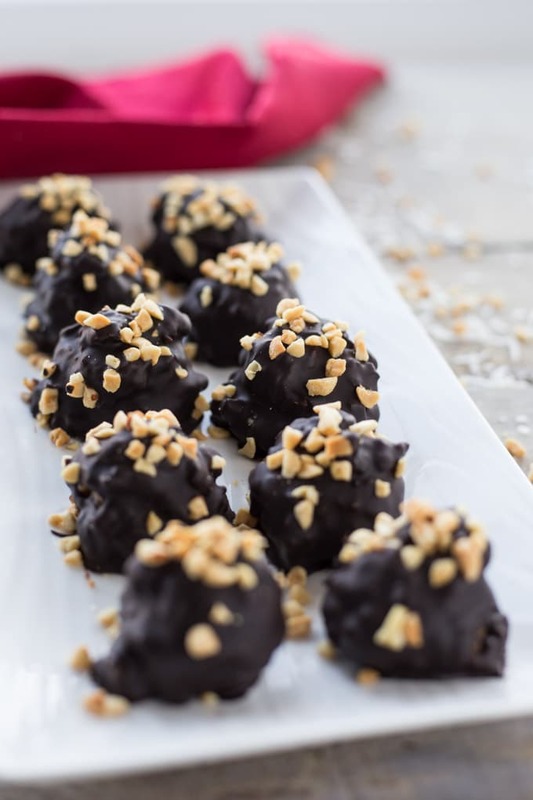 Remove the peanut butter mounds from the freezer and dip into the chocolate with a fork, letting any excess chocolate drip off before placing back on the baking sheet. Sprinkle chopped peanuts on each one as you go. (This will ensure they stick to the chocolate). Return to the freezer for 30 minutes, or until the chocolate has set. Store in an airtight container in the fridge or freezer. I use salted peanut butter in this recipe. If you don’t have salted, you may want to add a pinch of salt to the cookie mixture. Thanks Katherine! I’ve been storing these cookies in the freezer, allowing myself one per day. They are so darn addictive! At this rate, I’m going to have to make these 10 times before Christmas gets here!!! These look like such delicious treats! How bout I swap you some of my truffles for some of these yummy bites?! You can’t beat the chocolate peanut butter combo! Fabulous Leanne! Thanks Mary Ann! That sounds like a plan. Love a good cookie swap ;)! OMG! I want to ‘gobble’ these down! 🙂 I love dark chocolate and peanut butter together! Perfect treat for everyone for sure!! Happy Holidays Leanne! Thanks Kim! Right now they’re mostly a treat for me! I’m not doing a good job of sharing :). Happy Holidays to you too! These are exactly like one of my family’s favorite recipes, but healthy. We call them “walking balls” because you have to go for a walk after you eat them to burn off the calories. My mom, who doesn’t eat refined sugar, will be so happy she’s allowed to have these! Haha! That’s such an awesome name for cookies Kelsie! Yay! So glad your mom can eat these. Hope you get a chance to make them! Oh wow, these sound AMAZING! There is not much I love more than peanut butter and chocolate. Definitely pinning these to try this holiday season. You should definitely try them! They are quick and easy, and probably my favourite cookie I’ve made so far this holiday season! But I’m addicted to peanut butter, so probably a bit biased ;)!